In many of my recent blog posts, I complain about shallow characters. Not in The Orchardist! You will know these characters so well, you will be able to predict their actions. I don’t know for certain if that is good or bad, but these characters are rich and interesting! At the turn of the twentieth century, William Talmadge tends apples and apricots in his orchard in rural Washington State. One day, two young, scared, pregnant women appear on his land and, without speaking, Talmadge, Jane, and Della build a relationship. Of course, their lives are changed forever. And the story progresses from there, through the next 20 years. This is 1900 in the Pacific Northwest. Before roads, before a lot of civilization as we know it. People live hardscrabble lives off the land. I am again amazed that this is a first novel. Coplin’s writing renders depth into a small and (often) picturesque slice of life. Much as the characters in this novel are fiercely independent, so is Coplin, in her style. I found myself particularly intrigued by her use of chapters. When they need to be a paragraph long, they are. When they need to be pages and pages, they are. I also smiled at the names she uses. Talmadge is always Talmadge, to everyone. I had to check the inside flap of the book to see if Talmadge was his first name. And his friend Caroline Middey is always Caroline Middey. Every single reference, every time she appears, she is Caroline Middey. I don’t want to give the story away, but it is not a roses and lavender story. These folks, though incredibly successful at growing fruit, have hard social and interpersonal challenges. There is birth and death and violence and love and loyalty and betrayal. And always, apricots and apples and yummy food! 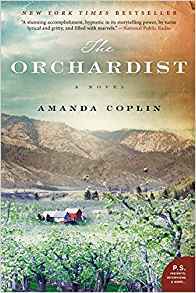 The Orchardist is a long book; it slows in places and speeds up in places. But it is the type of book you will read in front of the fireplace (or your modern-day version) evening after evening, for a few days. And you will think about these characters in-between your reading. Yes, I am still elevating and warming my ankle, so this was a PERFECT book for my current adventure! Recall reading this book a few years ago. Enjoyed it. Ah, Mary, we agree again. For the 872,651st time. Would you read it again, Donna?